If you hurry over to Casino Luck you can catch the end of its Party Week promotion and get yourself some free spins and deposit bonuses. Today if you play at least 33 real money rounds on slots at the casino you will be entered into a raffle where ten lucky players will win 100 free spins to use on Disco Spins tomorrow. 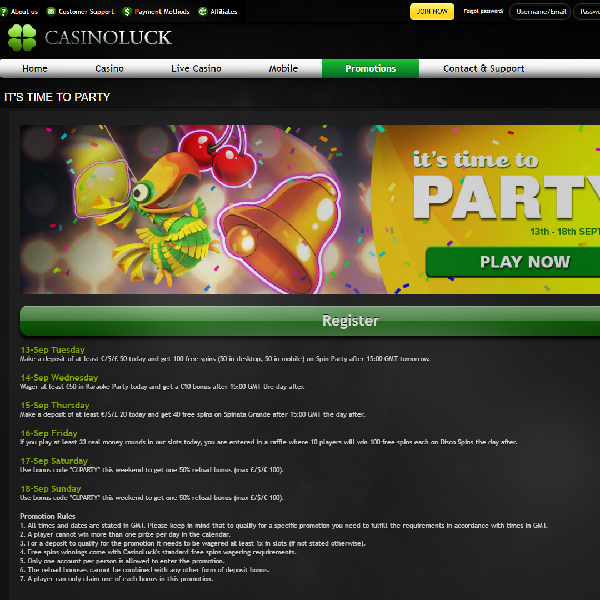 Then on both Saturday and Sunday you can use the bonus code ‘CLPARTY’ to claim a deposit bonus of 50% up to £100. This means that you can claim a total of £200 cash before the start of next week. Don’t miss out on the last three days of Party Week. Head over to Casino Luck today and earn your raffle entry and deposit bonuses and you could get next week off to a great start.